Due to flagging and wilting in the extended heatwave of the past 7 weeks, I’m playing catch up with painting and social media etc. I’m really not good in the temperatures of 34C plus which we’ve had lately. Anyway, enough grumbling! We had a fantastic lightning storm last night and torrential rain, so I’m feeling a bit more refreshed and don’t need to water the garden for a few days. 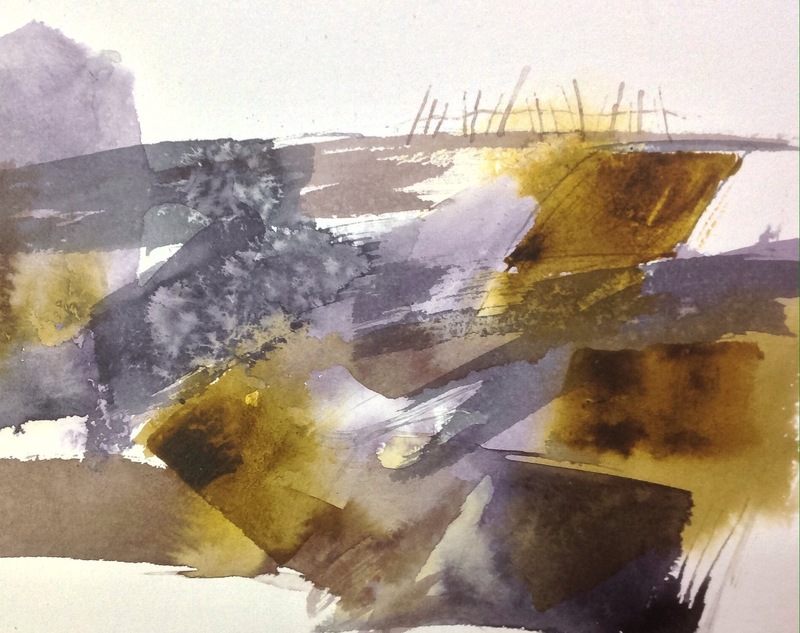 This post is really to tell you about a sketching trip I had to Thornham salt marsh on the North Norfolk coast a week ago, when it was a bit overcast and threatening rain (though it didnt) and so much more comfortable for walking and sketching. (I did post some of these images on Facebook etc, so they may look a bit familiar to some of you). I’d driven up to Thornham to catch the swathes of sea lavender that carpet much of the Norfolk marshes this time of year. But I was also astonished by the profusion of wildflowers (despite the drought, or maybe because of it) and butterflies along the paths on top of the sea defences – mallow, wild fennel, corn cockle, wild carrot and something with exquisite clover-like white and blue flowers which I haven’t yet identified (see lower left image). Feel free to enlighten me! I started off with gouache, which I’m enjoying using more frequently recently, combined with other media like pencil and Posca paint pens. 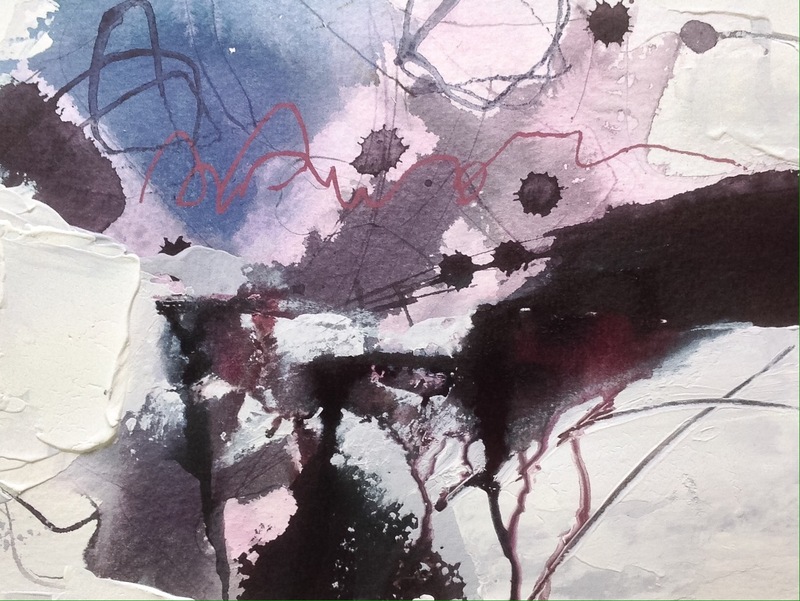 But I soon decided to switch to wet-in-wet watercolour as the gouache was drying too fast and causing the brush to drag. I thought wet-in-wet might allow me to evoke the looming skies and shadows on the marsh more effectively. I love the way the creeks reflect the light, especially as the skies darken. I’ve since been getting back into the swing of painting in my studio (only in the mornings for now, too hot after lunch), and I’m having fun putting some of these influences to use on canvas, which I’ll show you in my next post. Good old WordPress app. I uploaded the app as apparently you can now see images as you post them (instead of a string of computer code), and created the previous post ‘and mud, sand and stones’. Then I published it, only to discover the image sizes were all over the place and one (on my screen anyway) was stretched out of all proportion. So I’ve deleted it and here it is again… looks like future posts will have to be done on our laptop or via BlogPadPro as previously. Recent workbook sketches from a trip last week to Burnham Overy Marsh on the north Norfolk coast, in cold winds, grim sky and mist (the forecast said ‘fair’).